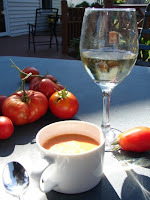 Today, I gathered fresh tomatoes from the garden and made one of my favorite summer dishes: gazpacho. I first had gazpacho while visiting a friend in Spain more than a decade ago. That memory lingers and the smell of the fresh tomatoes, cucumbers and cumin bring back some wonderful memories. After gathering garlic and onions from the root cellar, she next headed to the kitchen and pulled a ceramic jar of cumin from the pantry. She had been making this gazpacho recipe for years. It was one of her favorite things to make and the ability to produce it in early summer was a bonus. And every time she crushed those plum tomatoes in her hands, she thought about Rima, her neighbor in Cincinnati back when she was a child. Although she and her mother stood out in the heavily German neighborhood of Over-the-Rhine, they found a common soul in this small yet feisty immigrant from Spain----Andalusia, to be specific. Rima Reiniger was her name. She was married to Heinrich Reiniger, a local brewer. Although Rima provided plenty of hearty German meals for her husband, she also introduced him to the finer aspects of Mediterranean cooking and, in the process, introduced Colleen and Abelia to the wonders of the tomato. Although tomatoes were always growing in the Brody backyard, it was Rima who gave the tomato character. She told Abelia stories of Aztecs and conquistadors, of Moors and Castilians, often while crushing the “wonderful fruit,” as Rima called it. She told stories about the Aztec penchant for human sacrifice, often punctuating the tale by squeezing a tomato over a bowl as if it were a human heart. The tales frightened, yet fascinated Abelia. And she sat long hours in Rima’s kitchen, watching her cook and listening to her stories. It was there, in that small kitchen in Ohio, where Abelia tasted her first spoonful of the fragrant and delicious Andalusian gazpacho. And she has been making it ever since, using the same progeny from the seeds of Rima’s tomatoes given to her on that very day. Those plants grew in her greenhouse and Abelia tended to them with special care. At this point she held up a tiny yellow seed, coated in sweet red flesh that dripped from her fingertips. And with that, she crushed another in her hand, the chunky flesh oozing between her fingers, dripping into the large wooden bowl on the table. Abelia stared in fascination, her mouth and eyes wide. Rima was very theatrical. The kitchen was her stage; the only place she had true freedom and she used it. Although Rima and her husband were Roman Catholic, she often told tales of the Moors as if she were not merely of Moorish decent, but still actively fighting to conquer the Iberian peninsula in the early Middle Ages. Abelia knew that much of what Rima told her was highly exaggerated. No doubt her Moorish bloodline ran dry a thousand years ago or so and she wasn’t at all related to the Moorish general who was defeated at the Battle of Tours in 732, but she enjoyed the stories nonetheless. And Rima enjoyed telling them, that was for sure. Abelia squeezed the firm fruit in her hand. The tomato exploded around her fingers as chunks of cool, red flesh fell into the wooden dish. Rima took hold of Abelia’s hands, submerging them in the viscous mound. She squeezed her fingers together and swirled her hands in the bowl, demonstrating the proper technique to thoroughly blend the mixture. The tomatoes, seeds and all, swirled against the dark wood, the chunks of tomato getting smaller, becoming absorbed into the liquid. Rima removed her hands, once again wiping them on her apron before pouring in the cumin and garlic. A fragrant cloud wafted from the dish, and Abelia felt sweat beading on her forehead. Rima then dropped cucumbers, onions and peppers into the bowl and drizzled oil over the mixture, scolding Abelia if she slowed down the mixing process. Finally, Rima added stale breadcrumbs and topped it off with a squeeze of lemon and a stream of red vinegar, which she poured from above Abelia’s head. It splashed off her arms and into the deep dish. She counted out loud to five and then told Abelia to stop her mixing. Rima handed Abelia a towel to wipe her hands. Before covering the bowl with a cloth, she placed a wooden spoon into the concoction and removed a taste. With a smile, she handed it to Abelia. “First, you must try,” she said. Rima studied Abelia’s face, anticipating her reaction as the red, clumpy mixture entered her mouth. Abelia closed her eyes, letting the spice penetrate her taste buds. The fragrance floated into her sinuses, a simultaneous sensation that was unlike anything she had tasted before. “See,” said Rima. “It’s powerful. Nothing compares to a good gazpacho.” She picked up the bowl, pulling the cloth over the rim. “How do you think I got my husband?” she added with a smile. Gazpacho is the perfect summer dish. Back in Abelia's day, everything would have to be diced and crushed by hand. Luckily, food processors make the creation of gazpacho effortless. The following is a traditional gazpacho recipe, modified from that first gazpacho I tasted back in Spain. I think Abelia would be proud. Grind together the salt and cumin with a mortar and pestle. Crush the garlic clove and mix with the salt and cumin. In a bowl, add the olive oil and red wine vinegar. Add the garlic mixture to bowl and set aside. In a food processor, blend together the peppers, cucumber, onion and tomatoes. Add the oil mixture. Mix until smooth. For smoother consistency, add water. For thicker consistency, add stale bread. Finally, squeeze juice from 1/2 lemon into mixture. Let sit in refrigerator for at least an hour before serving. Thanks for the recipe. Gazpacho is so gooood in the summer time. I look forward to reading your book. When will it be out?